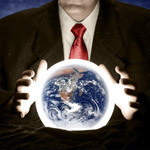 Here's the only sure-fire prediction you will probably ever hear from me: In the next few weeks, you will see hundreds of predictions about outsourcing trends for 2012. It's the annual end-of-year/beginning-of-new-year rite. In fact, a few intrepid souls have already posted some forecasts for the year ahead. So, wanting to get an early start, like people who do early holiday shopping, but not yet having formulated my own predictions — I'm still recovering from my call that the Philadelphia Phillies and New York Yankees would be playing in this year's baseball World Series — I thought I'd share what some brighter minds expect for the year that we'll soon be entering. 1. Wages will go up, but pricing will not. Atul Vashistha of Neo Group predicts that outsourcing suppliers will be under "continued pressure" to not raise their prices compared to 2011 levels, including weak exchange rates and U.S. dollar. While at the same time, he says, higher inflation will boost wages in India by 15%. Comparatively better news for nearshore customers, though: "Latin America wages will rise more than 8 percent." 2. More customers for IT providers in the Americas. Mr Vashistha also foresees more clients turning from India to "new geographies such as Brazil, China, Colombia, [and] Mexico." Along with Eastern Europe, Central and South America "are surging," thanks in part to a pie that will get bigger. 3. Software-as-a-service adopted by more companies. Application hosting will remain one of the fastest-growing segments of outsourcing, according to the analysts at Computer Economics. "Half of all organizations that use hosted applications are planning to increase their use of these services" they say in their report "IT Outsourcing Statistics 2011/2012." Gartner says SaaS "will establish itself as the new norm in the software industry" and grow from about $10 billion to about $13 billion in 2012. 4. Rapid growth for KPO. Knowledge process outsourcing will continue to gain acceptance and related tasks will go offshore, particularly to India. The KPO industry will be worth $13 billion next year, with India accounting for all but about $3 billion, says Atos Consulting. "The ‘data search, integration, and management’ sector within the KPO industry will account for the largest revenue share (29 percent) among different KPO verticals," says the Analyst Perspectives Consensus Report. 5. Look for new functions from new providers. Gartner research VP Ben Pring says part of the "hypercompetition" in the IT sourcing market will come from companies we haven't heard from yet. "Get used to new strange provider brands," he says, while predicting that some old-school names will end up as legacy companies managing legacy code. "Don't get locked into long-term deals with dinosaurs," he warns. 6. Even more demand for mobile development skills. Wild growth in mobile software is predicted by all the usual predictors. Gartner says mobile app downloads is a $15 billion business this year and will chart upward to $58 billion by 2014. A Forrester report is not so starry-eyed but still says tablet and smartphone apps will "recast the software and services landscape." So, nearshore software developers: Get on the money train. We'll no doubt have some more predictions as we get closer to the new year, but for now, it's a safe bet to follow the advice of Mr Vashistha: "expect frequent change and avoid going long on risk."